This wellness program is designed to encourage faculty, staff, and students to engage in activities that will benefit their overall health and wellbeing. It incorporates current campus and community initiatives where participants can earn points for engaging in events that represent the 8 dimensions of wellness – emotional, environmental, financial, intellectual, occupational, physical, social and spiritual. A range of new and innovative activities, many of which are easy to do and can be done during the workday, have been incorporated, affording participants a wide range of choice to contribute to their wellness. Prizes will be given to those participants that acquire a certain number of points, and top earners will receive additional incentives. Before the program is launched, we need a unique name that captures the spirit of PHHP. This is where you come in! 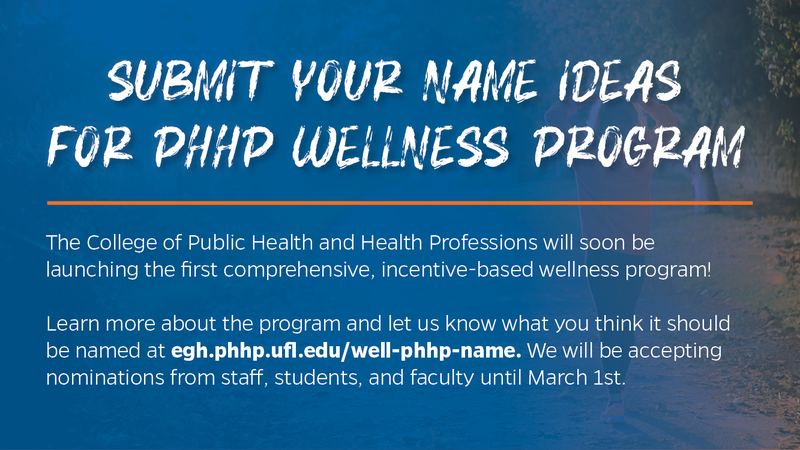 We are accepting nominations for the PHHP Wellness Program name until March 1st. Please submit your nomination and ideas in the form below. Get ready to start the journey toward enhanced wellness!